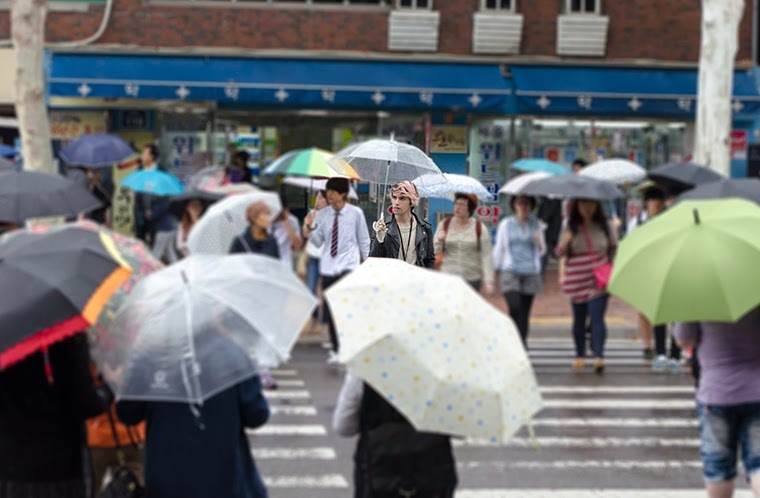 The moment a foreigner steps foot in Korea, he's bound to never being able to blend in. That's how I've been feeling since my arrival to Seoul. I wanted to capture the idea of not blending in and fuse it with standing out. 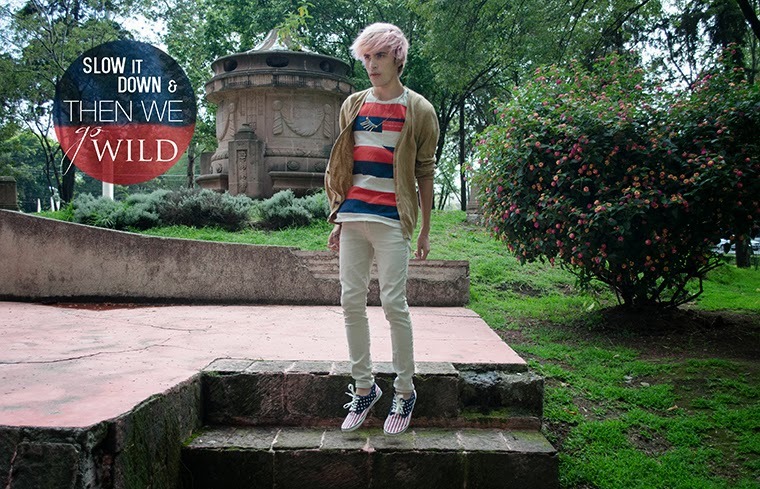 So, this editorial is all about standing out from a crowd in a good way. I'm wearing a whole outfit from H&M, accessories included and hi-top sneakers from FUBU. 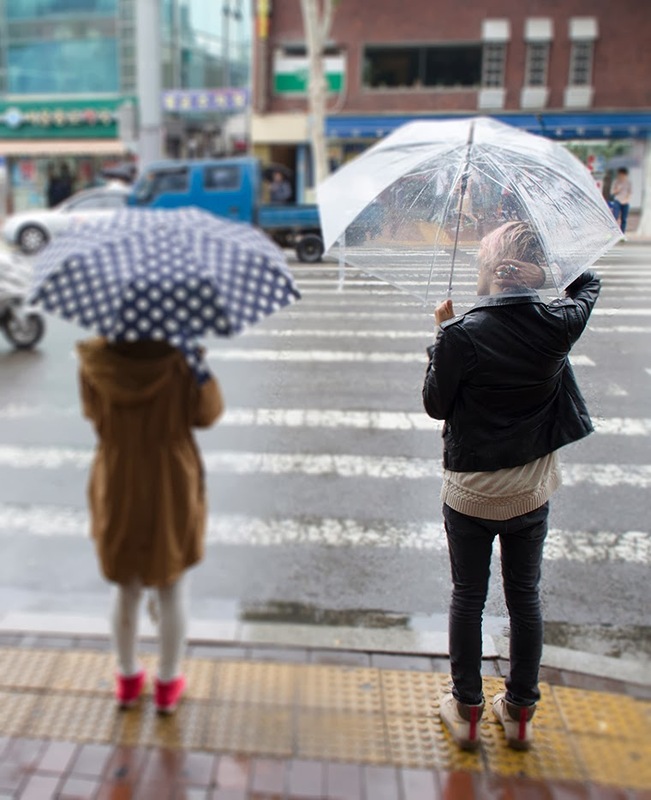 Photographer: Frederik Lehmann Olsen (special thanks for not complaining because it was raining). Currently listening: Paloma Faith - 30 Minute Love Affair. Let the rain wash your tears away. 1. 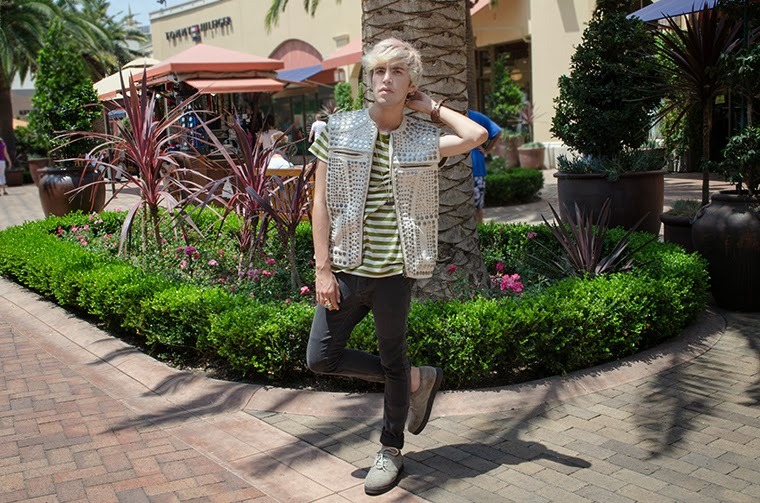 Studded vest, from H&M. 2. Striped green t-shirt, from H&M. 3. Super skinny paneled jeans, also from H&M. 4. Gray creepers, from Kr3w. 5. Eye necklace, from H&M. 6. Full finger ring, from H&M. Retail therapy is one of the most ridiculous ideas I've heard in a long time. I've never tried that, have any of you? For me, going shopping is a nice activity to do alone or with some close, reliable, friend or maybe two friends but that's pushing the bar a little. I'm not gonna lie, I like shopping but here's a little secret/tip of mine: I only shop things on sale. It's been years since I paid regular price. I don't know, buying something when you know its price will drop doesn't appeal to me. I went with some of friends to an outlet and most of that experience was nice, although some of it was a bit overwhelming. It was a group of 4 and we had a time limit. We established some stores that everybody wanted to see and after that, each of us would find its own path. That was really smart. Going shopping could be incredibly stressful and awful but also a really nice bonding experience. I recommend taking a friend that isn't the same size as you, then you can find some things for him and he can find some for you; also, bring someone with a lot of patience, so the process won't become tiring for him. // Terapia de compras se me hace una de las ideas más ridículas que he oído en un buen rato. Nunca lo he intentado ¿ustedes sí? Para mí, ir de compras es una actividad padre para hacer solo o con algún amigo cercano, confiable... Quizá dos amigos, pero ahí ya hay que tener cuidado. No voy a mentir, me gusta ir de compras pero aquí hay un pequeño secreto/tip de mi parte: Sólo compro en rebaja. Han pasado años desde que pagué precio regular; no sé, la idea de comprar algo cuando sabes que bajará de precio no es atractiva para mí. Fui con un par de amigas a un outlet y la mayor parte estuvo bien, aunque hubo momentos caóticos. Estaba en un grupo de cuatro y teníamos una hora límite. Decidimos cuáles eran las tiendas que todos queríamos ver para ir juntos y, luego, cada quien encontraría su camino. Eso fue muy inteligente. Ir de compras puede ser una experiencia muy estrenaste y terrible pero también un buen momento para crear y fortalecer lazos. Yo recomiendo llevar a un amigo que no use la misma talla que tú, entonces puedes encontrar cosas para él y él para ti; también, hay que procurar llevar a alguien con mucha paciencia, entonces el proceso no será fatigante. Cuando íbamos a medio camino, mi amiga y yo decidimos tomar un receso de 10 minutos para tomar fotos y relajarnos. Después de eso, creo, fuimos mucho más eficientes. Quizá fue porque el grupo entendió cuál era la razón principal para ir de compras y no hubo quejas por hambre u otras cosas que puedes hacer cuando las tiendas cierran. Jaja. Por cierto, este es un atuendo de compras para mí. 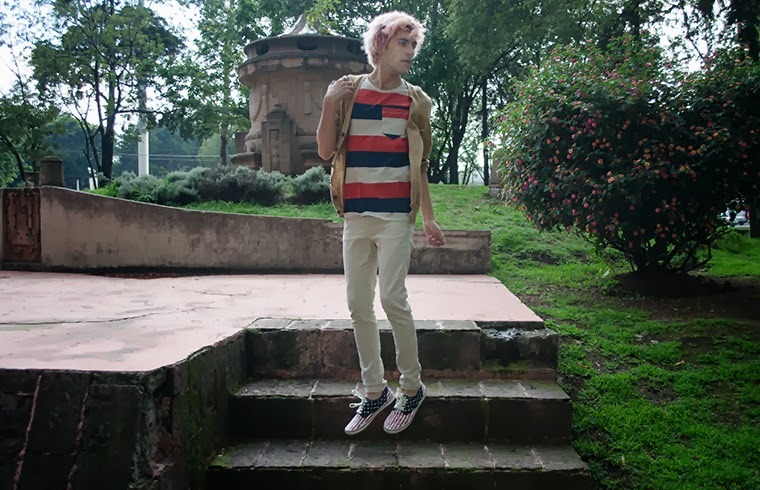 Mientras esté vivo, jamás me verán en chanclas y/o pants. Lo prometo. Do you have any shopping strategies? Currently listening: One Direction - Up All Night. Right now, I'm living in an apartment with another five guys that go to the same school as I do. One of them is really conservative and said that in his country (France) if guys use skins products it's automatically associated with a lack of manliness, therefore, he will never do it. One of the other guys (from Denmark) said that back home, everyone is using some sort of skin product and nobody is insulting another fella for doing it. // En este momento de mi vida, vivo en un departamento con otros cinco chavitos que van a la misma escuela que yo. Uno de ellos es híper conservador y dijo que en su país (Francia) si los hombres usan productos para la piel, automáticamente se asocia eso con una falta de masculinidad, por eso, él nunca lo haría. Otro (de Dinamarca) dijo que, en su país, todo mundo está usando algún tipo de producto para la piel y nadie insulta a otro camarada por hacerlo. 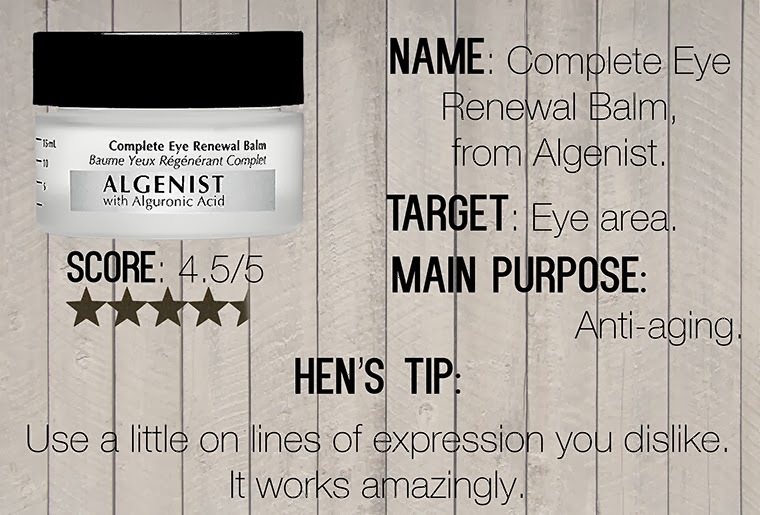 The first is the Complete Eye Renewal Balm, from Algenist. It's focused to work around the eyes, making little wrinkles and lines disappear, reduce puffiness under the eyes and also improve the look of dark circles. I'm not giving it perfect score because the container is a little small but otherwise this cream is amazing, light, absorbs quickly and leaves a matte effect after applying it. 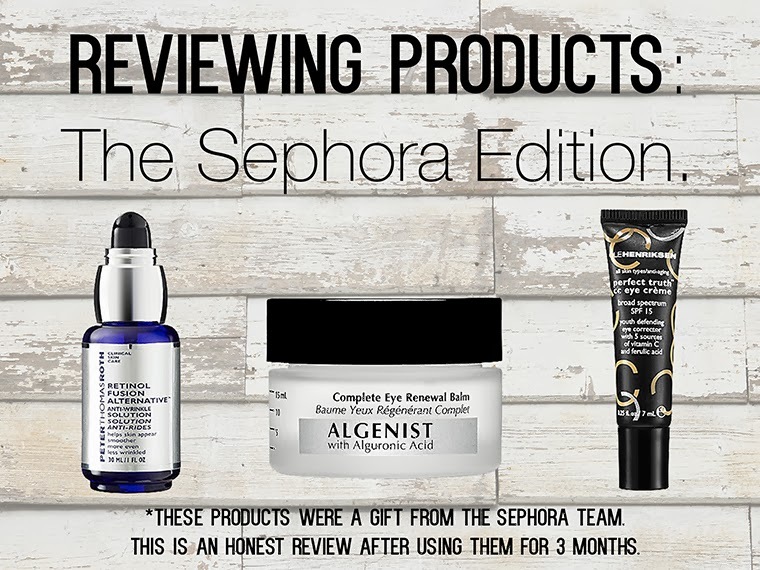 // El primero es el Complete Eye Renewal Balm, de Algenist. Se enfoca en trabajar alrededor de los ojos, haciendo que pequeñas arrugas y líneas desaparezcan, reduce las bolsas y mejora el aspecto de las ojeras. No le doy calificación perfecta porque el contenedor trae poquito producto pero ignorando eso, esta crema es increíble, ligera, se absorbe rápido y deja un efecto mate después de la aplicación. 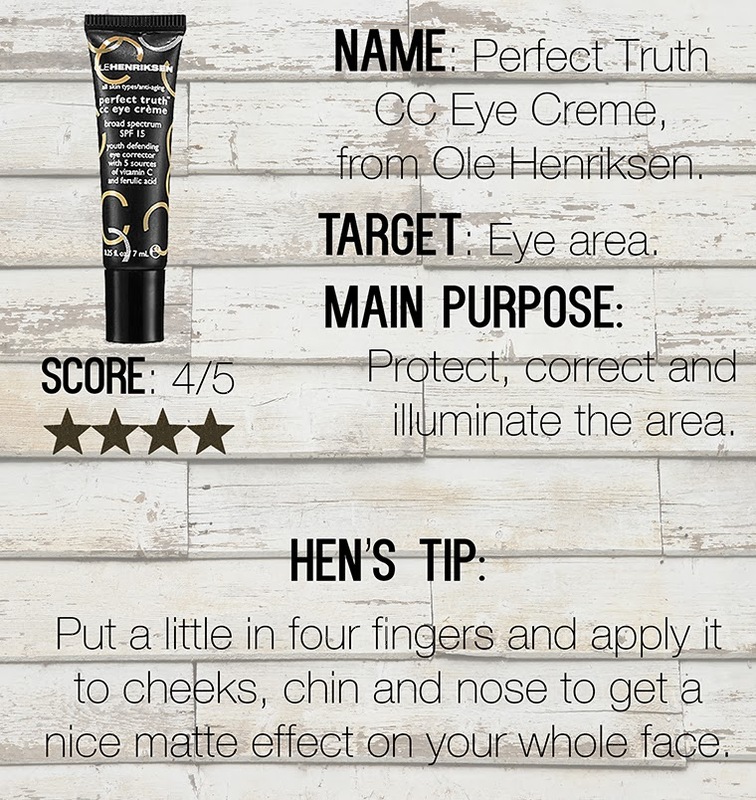 Next is the Perfect Truth CC Eye Creme, from Ole Henriksen. CC stands for Color Control/Correction; this cream contains SPF 15 and its main purpose is to correct the skin tone around your eyes. Truth be told, I use it on my whole face and the results are great, you instantly look refreshed and the tone of your skin gets more even. If the container was a little bigger and the texture was a little more dense, it would have perfect score. // El siguiente es la Perfect Truth CC Eye Creme, from Ole Henriksen. CC significa Color Control/Correction; esta CC cream contiene factor de protección solar 15 y su objetivo es corregir el tono de la piel alrededor de los ojos. Siendo honestos, yo la uso en toda mi cara y me encantan los resultados, inmediatamente te ves más fresco y el tono de la piel se empareja. Si el contenedor fuera un poquito más grande y la textura más espesa, tendría calificación perfecta. And last but not least, the Retinol Fusion Alternative Anti-Wrinkle Solution, from Peter Thomas Roth. It's a light cream that's designed to reduce wrinkles, smoothing skin, make it look brighter and healthier without irritating. The smell is a little strong and the tip of the applier always gets clogged with a bit of product. Other than that, it has really helped with my "smile lines" and my neck. 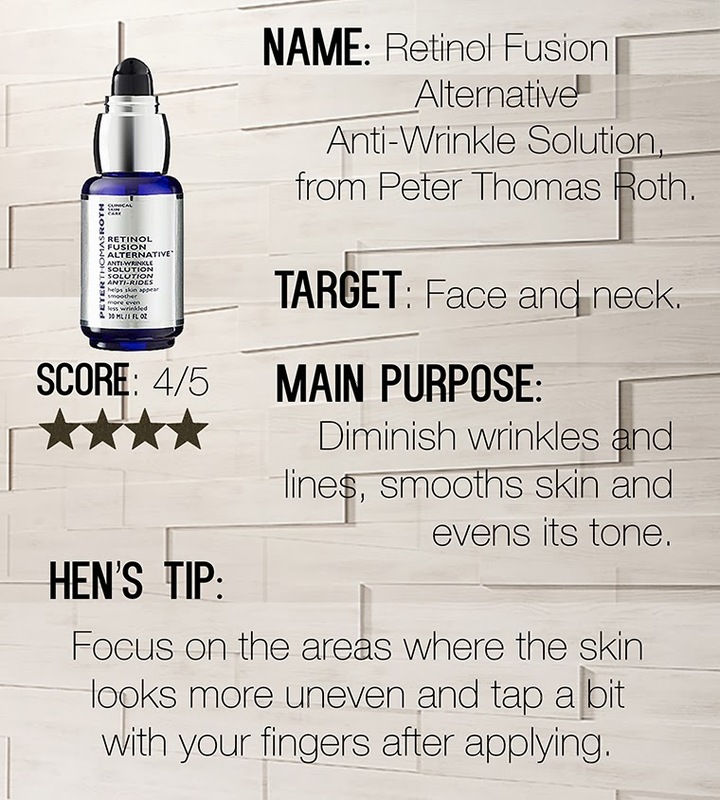 // Y por último pero no menos importante, la Retinol Fusion Alternative Anti-Wrinkle Solution, de Peter Thomas Roth. Una crema ligera diseñada para reducir arrugas, suavizar la piel y hacerla lucir más brillante y saludable sin irritar. El olor es un poquito fuerte y la punta del aplicador siempre se tapa con un poco de producto. Quitando eso, en serio ha ayudado con mis líneas de expresión por sonreír y mi cuello. That's all from the review department. All I can say now is that using products on your skin will never reduce your manliness it will, however, make you look better. So, be brave and try something out. Go to Sephora and explore a little. Thanks again to the PR team for sending these to me. // Eso es todo por parte del departamento de crítica. Todo lo que puedo decir es que usar productos en la piel no reduce la masculinidad, lo que sí es que te hace ver mejor. Así que, seamos valientes e intentemos algo. Vayan a Sephora y exploren un poquito. Gracias otra vez al equipo de Sephora por mandarme estas cosas. 1. Simple striped t-shirt, from H&M. 2. Super skinny jeans, from H&M. 3. Connaught St. Ginger Suede Lace Up Boots, from Frank Wright 2700 Collection. 4. Leather waffle backpack, from a Korean little shop! 5. 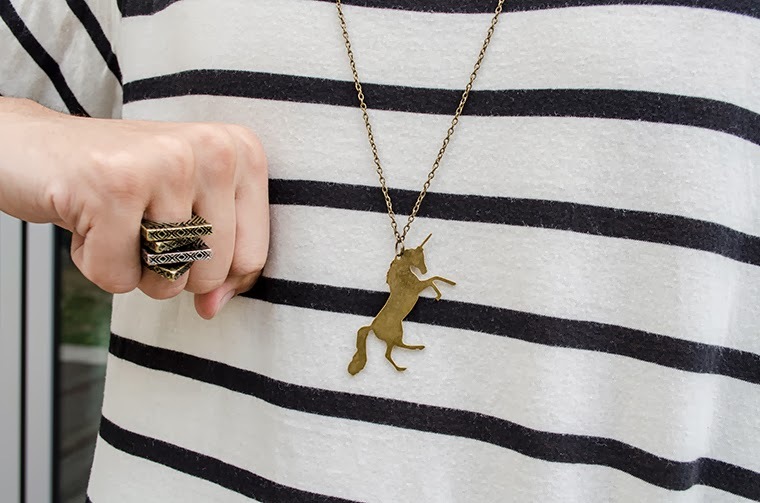 Unicorn necklace, from titiMadam. 6. Geometric rings, from Pull & Bear. As I mentioned on a previous post, here is my take on a simple t-shirt outfit. I chose to go with a striped loose fit tee and I paired it up with amazing super skinny jeans rolled up a bit and my coolest boots. To add something interesting, I threw my leather backpack onto the mix (it matches the color of the boots perfectly). Moving onto the accessories, I tried to keep it very simple: a small statement unicorn necklace, brown leather bracelet and four geometric rings in one finger. The backdrop is a simple garden with wooden floor, nothing fancy but still looking good. Also, regarding my poses, this is an attempt to master the "just standing there" attitude. What do you think? Did I get it right? For a guy who was problems editing his outfits, the simple t-shirt combo surprisingly felt really cool. I was super comfortable but I knew that I looked good and produced. Definitely not boring. 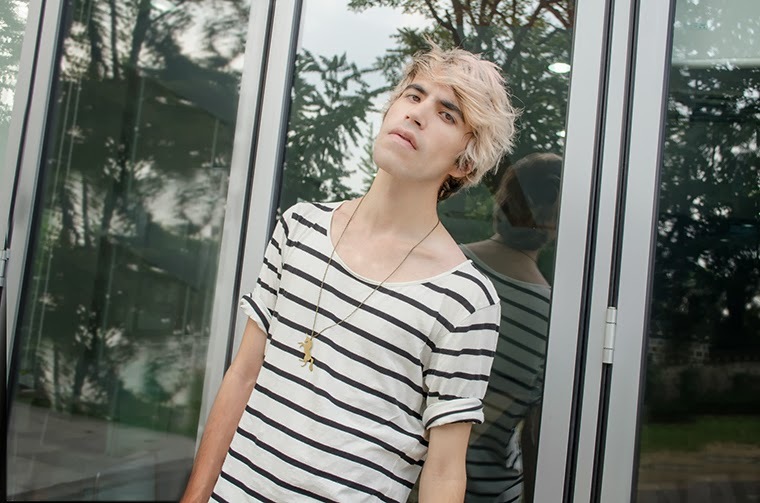 I think striped t-shirts are good basic pieces that can go with anything, really. And I never thought of my backpack as an accessory but it made the whole outfit much better. Needless to say, the boots also helped a lot, they're amazing. // Como mencioné en un post anterior, acá está mi tirada en un atuendo con camiseta simple. Elegí una de rayas, con talle flojo y la combiné con unos jeans súper entubados buena onda, enrollados un poquito, y mis botas más padres. Para añadir algo interesante, metí mi mochila de piel a la mezcla (su color combina perfectamente con las botas). Pasando a los accesorios, traté de mantener estas parte muy simple: un pequeño collar de unicornio, pulsera café de piel y cuatro anillos geométricos en un solo dedo. El escenario es un jardín sencillo con piso de madera, nada elegante pero de buen ver. También, con respecto a mis poses, éste fue un intento de dominar la actitud "sólo parado ahí"; ¿qué piensan, lo logré? Para un chavito como yo, que tiene problemas de edición en sus atuendos, el combo de la camiseta sencilla sorpresivamente se sintió muy bien. Estaba súper cómodo pero sabía que me veía bien y producido. Definitivamente no fue una elección aburrida. Creo que las camisas rayadas son buenos básicos porque pueden ir con cualquier cosa, en serio. Y nunca creí que mi mochila pudiera ser un accesorio pero hizo que todo se viera mejor. No hace falta decir que las botas ayudaron mucho, las amo. How To Pull Off a Simple T-shirt Look? 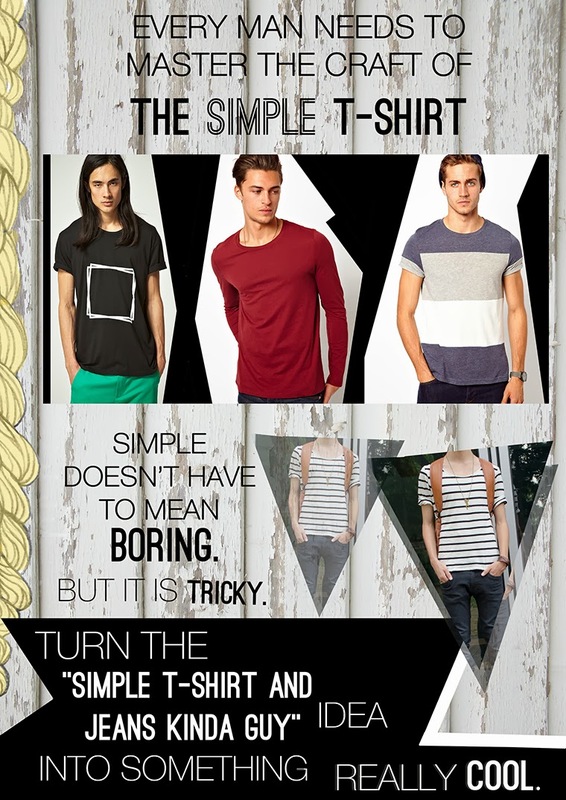 Every man needs to master the craft of the simple t-shirt. "WHY?" You may ask; "Wearing a t-shirt is easy", you may say; "I'm a t-shirt and jeans kinda guy, nothing fancy", you may add. And to all that I say: Wearing a t-shirt is easy, wearing a simple t-shirt in the best way possible and look awesome is not. I really hate when guys say that they're a "jeans and t-shirt kinda guy" and make it look like a bad or really not stylish thing. I say, screw that. It's possible to be cool with only a t-shirt. There are two similar roads. One is to rely on the awesomeness of your t-shirt and; the other is to spice things up by adding accessories. For the first, you need to be aware of a few key points: the fit, it has to be right (if you're going for slim and fitting, that's great. If you're going for boxy and oversize, that's awesome too), it needs to look how it's supposed to; the fabric, sometimes it helps to have a fancy fabric, it could be metallic, silky, acid washed or really stiff. If the fabric is great, then you'll want to show it off and; lastly, sleeves and neckline, make sure you feel confident with the ones you choose and you're good to go. Wear nice pants and shoes but don't fret too much about it. For the latter road, the t-shirt must be a nice one but not too special. It will work kinda like a blank canvas. For this, you have to make sure that the pants are cool and you have some special shoes on. 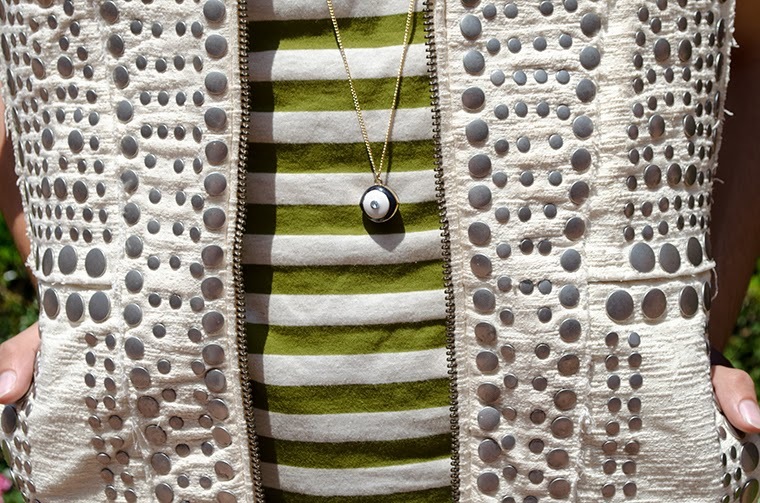 It doesn't hurt to add necklaces, rings, bracelets, caps, beanies or, even, a great backpack. 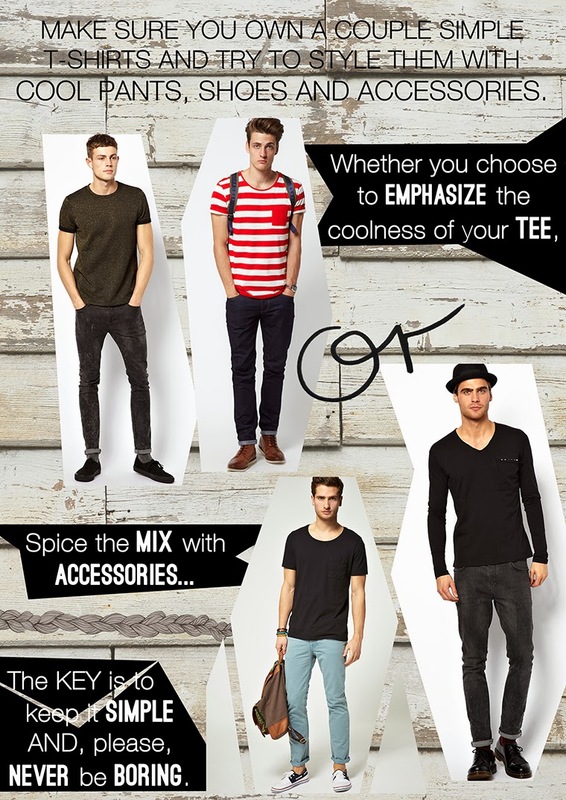 The idea behind the simple t-shirt look is to make it seem effortless but still produced. Knowing how to wear your basics gives you tons of different options everyday; for me, it's nice to not wear a jacket all the time and since I practice what I preach, expect my simple t-shirt look tomorrow! // Todo hombre necesita ser un maestro en el arte de la playera básica. "¿POR QUÉ? ", podrían preguntar; "Usar una playera es fácil", podrían decir; "Yo soy básico y uso playeras y jeans simples", podrían añadir. Y a todo eso, yo respondo: Usar una playera es fácil, usar una playera básica en la mejor forma posible y verte muy bien no tanto. 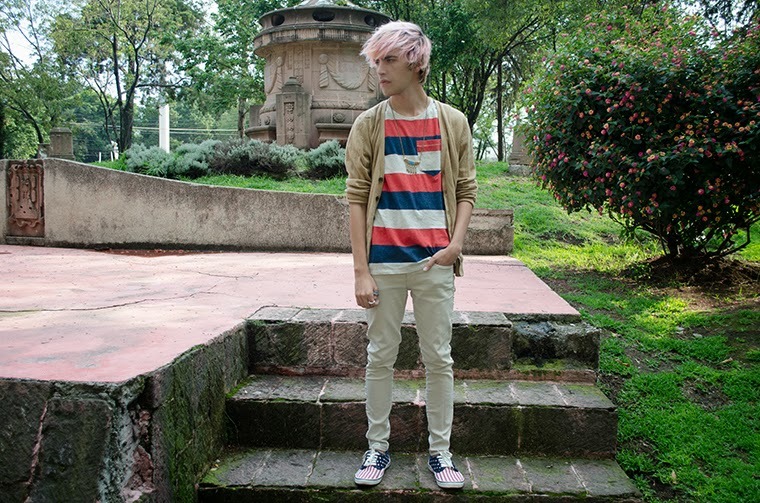 En serio odio cuando escucho eso de la playera y los jeans, es peor cuando lo hacen ver como algo sin potencial o malo. Yo digo, a la fregada con eso. Claro que es posible verse súper bien con sólo una playera. Hay dos caminos similares. Uno es depender del factor buena onda de la playera y; el otro, es aderezar las cosas añadiendo accesorios. Para la primer ruta, es necesario estar pendiente de varios puntos clave: el talle, tiene que ser el correcto (si la playera debe ser ajustada, que lo sea; si debe ser sobre-entallado y estilo caja, también), el chiste es que luzca como debe de ser; la tela, a veces ayuda tener telas fancy, puede ser metálica, sedosa, maltratada o muy tiesa. Si la tela es grandiosa, el punto es enseñarla y; por último, mangas y cuello, hay que estar seguros de estar cómodos con la elección y ¡voilá! Todo listo. La otra opción implica usar una playera buena pero no muy especial. Va a funcionar más o menos como un lienzo en blanco. Para esto, hay que asegurar que los pantalones estén padres y los zapatos sean especiales. No hace daño añadir collares, anillos, pulseras, gorras, gorritos o, incluso, una gran mochila. La idea tras el look de la playera básica es hacer que luzca sin esfuerzo pero producido. Saber cómo usar los básicos da un chorro de opciones para intentar día con día; para mí, se siente bien no usar chamarras todo el tiempo y, como practico lo que predico, ¡esperen mi atuendo honrando a la playera simple mañana! 2. 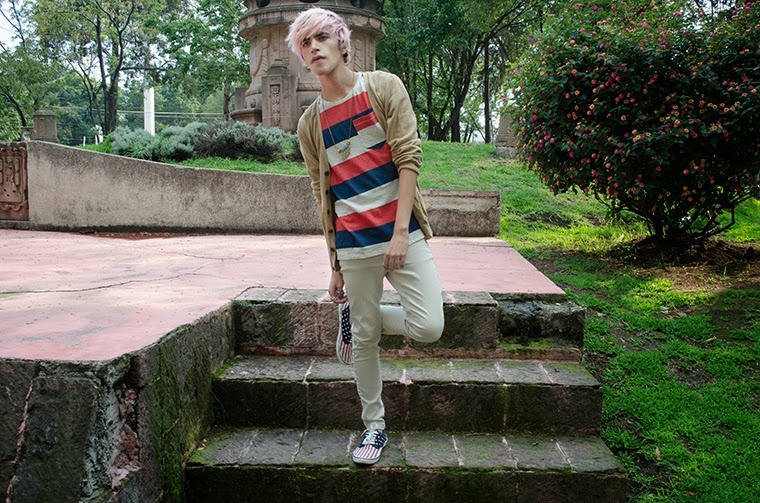 Striped t-shirt, from H&M. 3. Studded super skinny beige jeans, also from H&M. 4. American flag sneakers, from Urban Outfitters. 5. Aztec necklace, from Asos. 6. Anchor rings, from Asos. Once upon a time, way before I started this blog and when I was on Lookbook full time, jumping was my favourite thing to do on photos. Guess I fell in love with those Lacoste ads where several models jump and look amazing and stuff. So, homaging my old ways, I tried to shoot jumping outfit photos for this one. Going wild here. Truth be told, I was a bit rusty and forgot how hard it is too look nice while being in mid-air. You need to control the muscles on your face, especially your eyes and mouth, the position of your head, think about what you're doing with arms and legs. Oh boy, it's complex. Word of advice? Watch out for necklaces bouncing, I always hurt myself, haha. Most of my outfit comes from H&M. If I haven't said that before, H&M is such a great fast fashion brand. I always, ALWAYS, find something I like on the store and, usually, it's fairly priced. 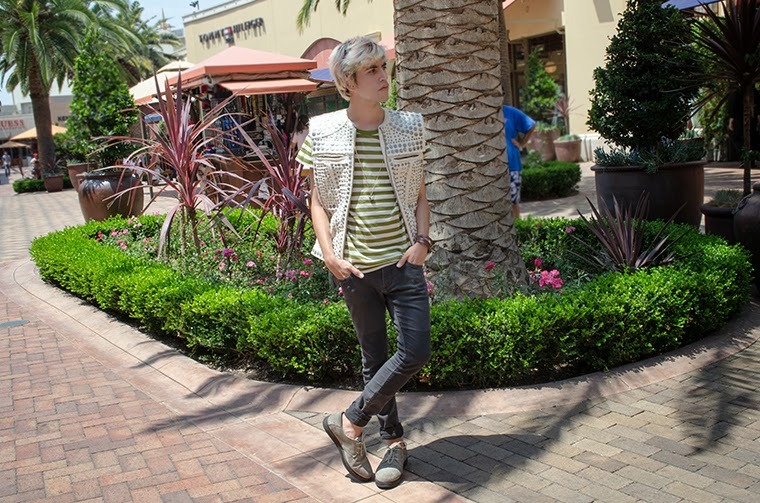 I was craving beige skinny jeans for ages and this ones with the studs look pretty cool. Also, it has been a long time since the last time I wore a cardigan and I personally think that cardigans are really great. They're light and nice and warm. 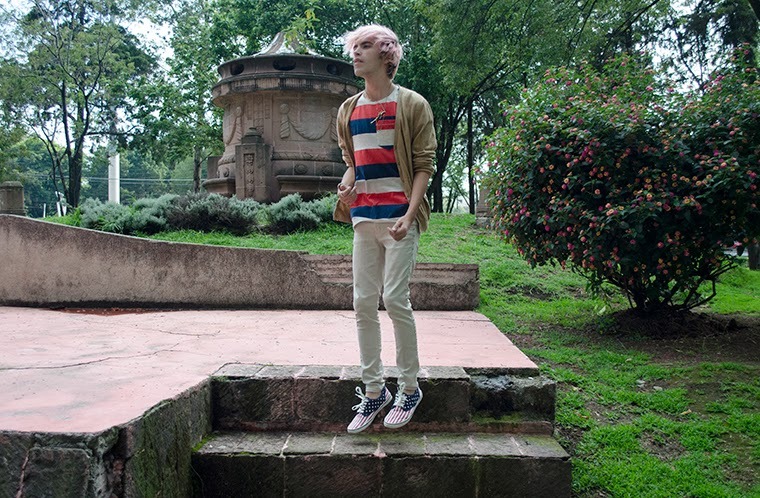 // Hubo un tiempo, mucho antes de que iniciara este blog y cuando estaba en Lookbook tiempo completo, donde brincar era mi cosa favorita para las fotos. Supongo que me enamoré de esa publicidad de Lacoste donde muchos modelos brincan y se ven increíbles y así. Homenajeando mis antiguos hábitos, traté de hacer fotos brincando con este atuendo. Fui un loco, un salvaje. Siendo honestos, estaba un poquito oxidado y olvidé lo difícil que es verse bien cuando estás suspendido en el aire. Necesitas controlar los músculos en tu cara, especialmente ojos y boca, la posición de tu cabeza, pensar en lo que harás con piernas y brazos. Oh sí, es complejo. ¿Un tip? Cuidado con los collares que rebotan, yo siempre me lastimo, jaja. Casi todo mi atuendo es de H&M. Si no lo he dicho antes, H&M es una gran marca de moda rápida (fast-fashion). Siempre, SIEMPRE, encuentro algo que me gusta y, generalmente, el precio es razonable. Deseaba jeans entubados en beige desde hace mucho y estos, con las tachuelas, se ven bien padres. 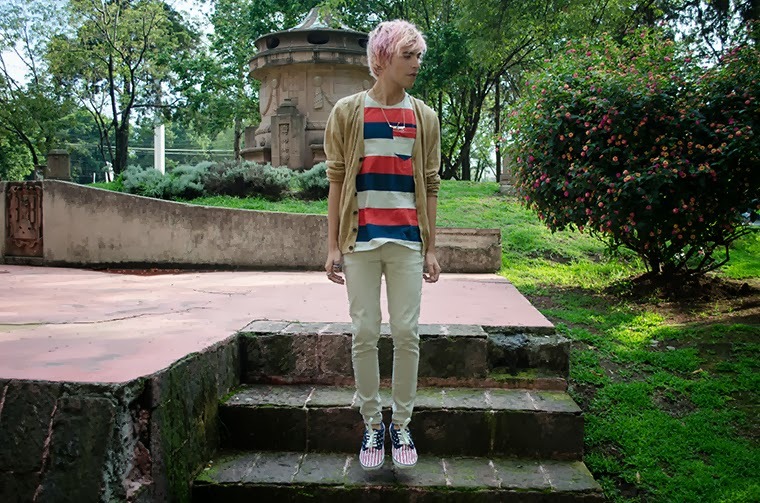 Además, hacía mucho que no usaba un sweater de abuelito/cardigan y, personalmente, creo que ese tipo de sweater es bastante buena onda. Son ligeros, bonitos y abrigadores. Currently listening: Ellie Goulding - You, My Everything. 1. 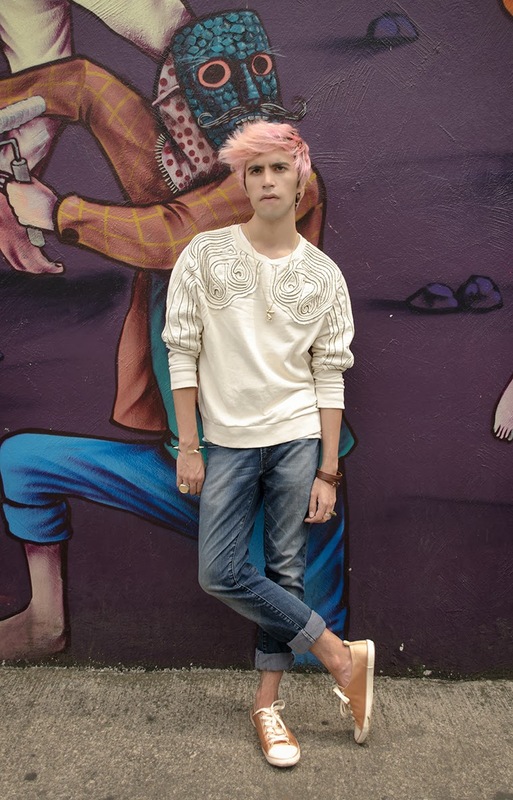 Embellished cream sweatshirt, from H&M. 2. Acid wash skinny jeans, from Zara. 3. Shiny sneakers, from H&M. 4. Hare necklace, from H&M. 5. 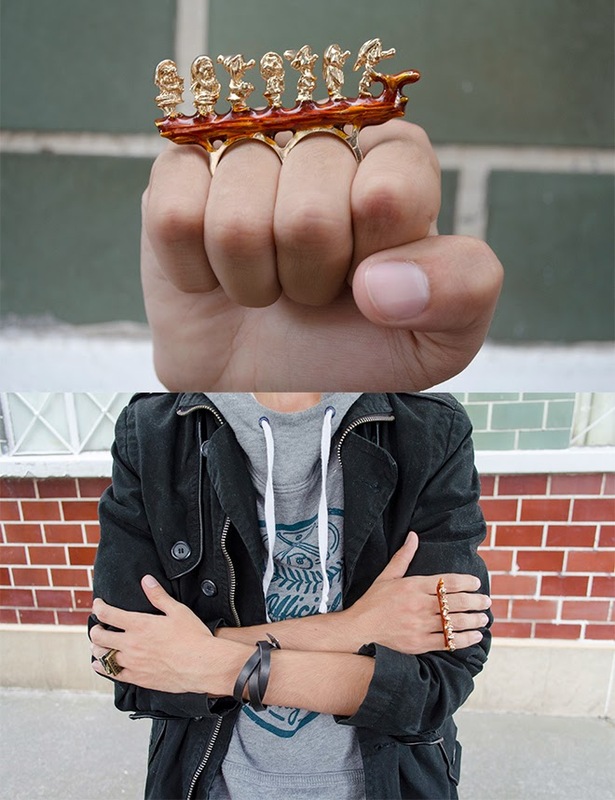 Rings and bracelets, also from H&M. I have some good days and some where I feel homesick. 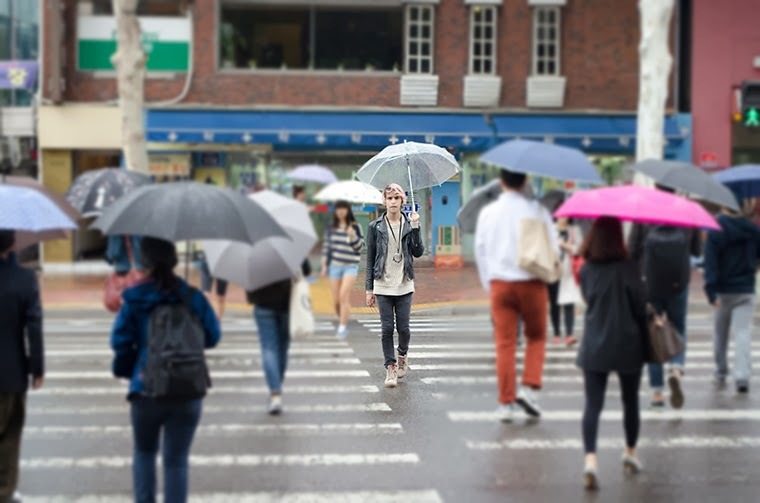 When you're abroad, you start to miss the weirdest things; for example, I miss Nutella; my friends; lemonade; trash cans on the street (believe it or not, Seoul is lacking in that department); my closet; frozen corn. I miss freakin' frozen corn, for God's sake! Anyway, the cool backdrop in these photos reminds me a lot of Mexico. Murals are a big thing back home and finding one, randomly, in perfect state in a street is magnificent. 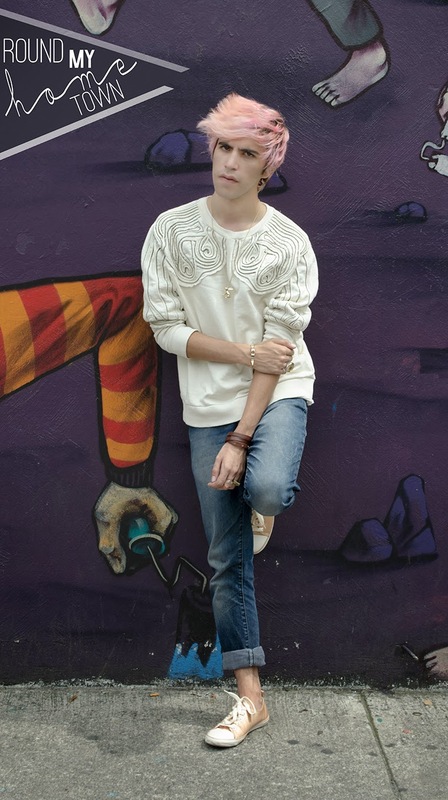 I really like an artsy feeling incorporated into fashion, so the match between the mural and my baroque sweatshirt is perfect. 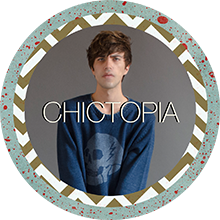 It's an amazing sweatshirt, probably my favourite in a long time. Going back to basics could also mean missing the place where you came from and trying to pay homage to it. 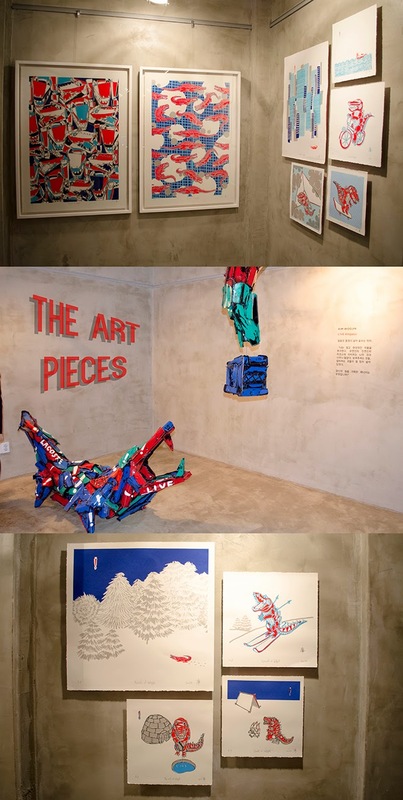 Of course there are lots of cool things here in Seoul that I'm sure I'll miss when I go back home; it's just that, on those mean reds, I get a bit sad and sensitive. And then I remember there's Taco Bell in here and my soul begins to heal. // Tengo algunos días buenos y otros donde extraño mi hogar. Cuando estás en el extranjero, comienzas a extrañar las cosas más raras; por ejemplo, extraño la Nutella; mis amigos; limonada; botes de basura en las calles (créanlo o no, Seoul no tiene); mi clóset; elotes amarillos congelados. Extraño elotes congelados, ¡háganme el favor de Dios! En fin, el escenario buena onda para estas fotos me hace pensar mucho en México. Los murales son algo importante ahí y encontrar uno, al azar, en la calle y en perfecto estado es magnífico. En serio me gusta cuando la moda y arte se amalgaman, entonces, la combinación entre el mural y mi sudadera barroca es perfecto. Es una gran sudadera, probablemente mi favorita en mucho tiempo. Volver a los orígenes también puede significar extrañar el lugar de donde vienes y rendirle un pequeño homenaje. Por supuesto que hay muchas cosas bien padres acá en Seoul que estoy seguro extrañaré cuando regrese a casa; es sólo que, en esos mean reds, me pongo un poquito triste y sensible. Y luego me acuerdo que aquí sí hay Taco Bell y mi alma comienza a sanar. Currently listening: Bridgit Mendler - Hurricane. It really felt like the first time. 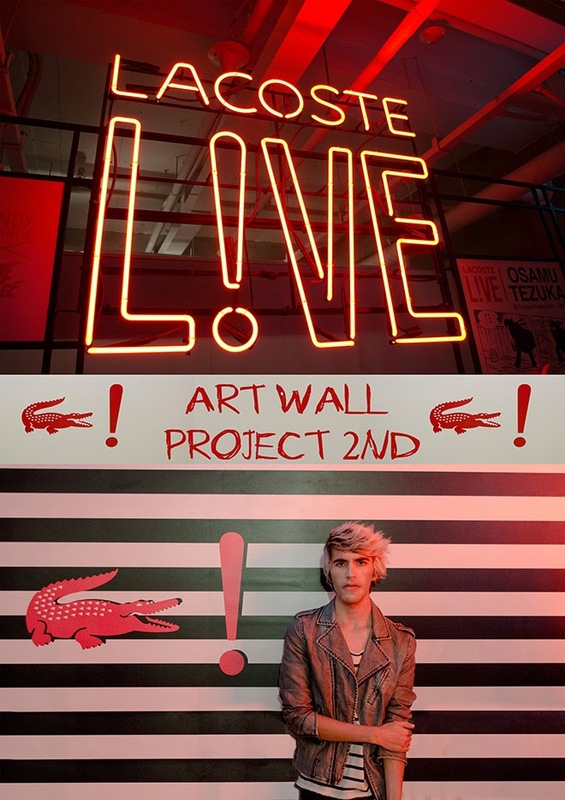 I got invited to the Art Wall Project 2nd by Lacoste Live last week in Gangnam, South Korea. 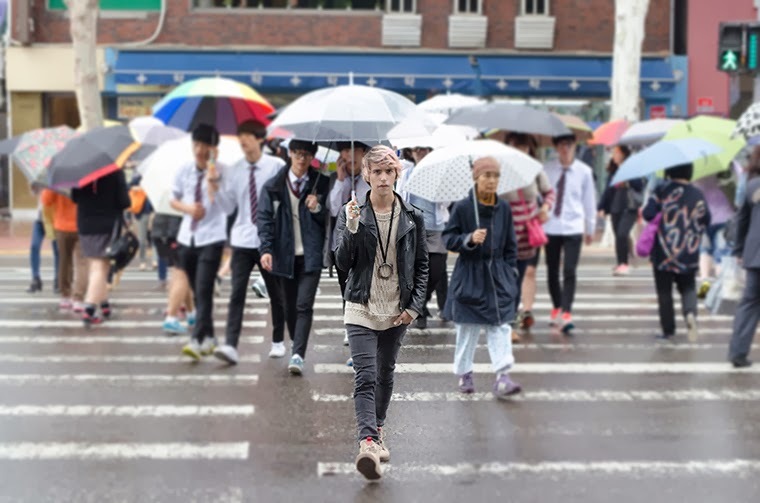 Gangnam is one of the coolest districts here in Seoul, it's so artistic and fancy. I loved it. 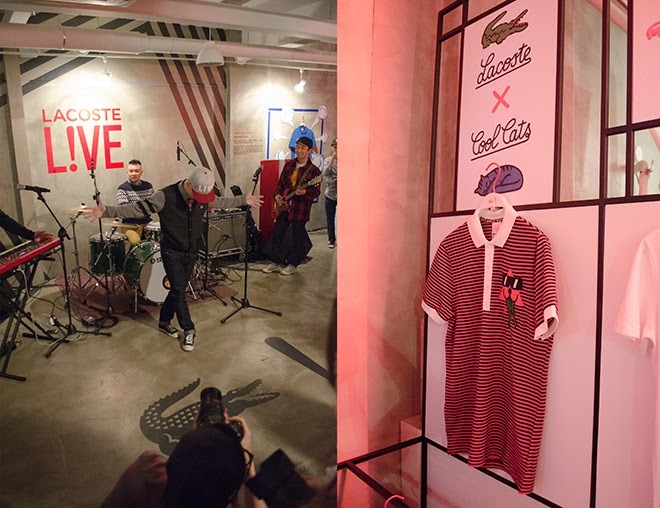 The Art Wall Project consists on Lacoste supporting artists with unconventional talent, working with them and creating fun, unique and cool designs for the brand. 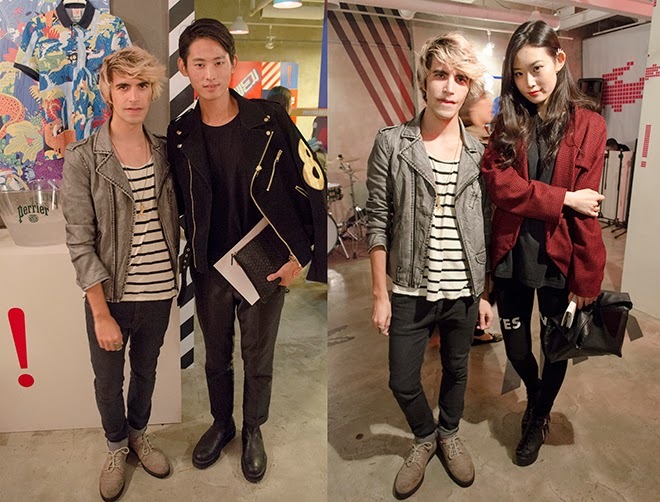 The event was held at the Lacoste flagship store and it was super fun. They had a garden with barbecue (including marshmallows on a stick that were to die for), a billion Perrier lemonades, popcorn, a photo wall with some funky signs and an underground art gallery with a stage for a little concert. Amazing. I was the only international guest there so it was very interesting to be surrounded by important people on the Korean fashion industry. I met designers, models, photographers, bloggers, editors, a bit of everything. Everyone was friendly and willing to talk for a bit. It was such a nice atmosphere. It felt like going to my first fashion event all over again. This time, luckily, I knew that I could bring a friend, haha. // En serio se sintió como la primera vez. 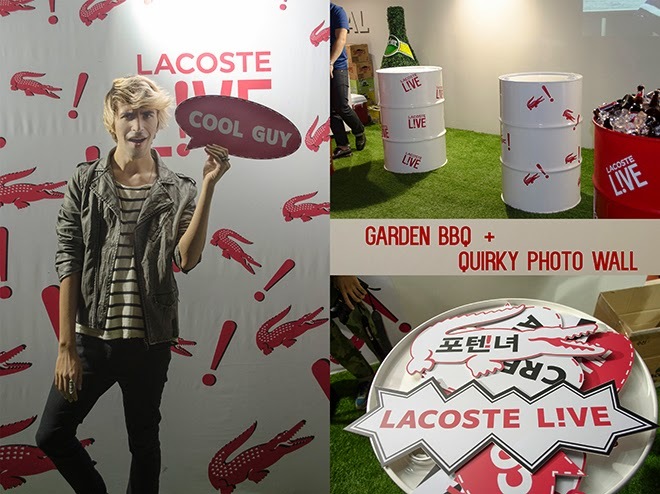 La semana pasada, me invitaron al Art Wall Project 2nd por Lacoste Live en Gangnam, South Korea. Gangnam es uno de los distritos más padres aquí en Seoul, es muy artístico y fancy. 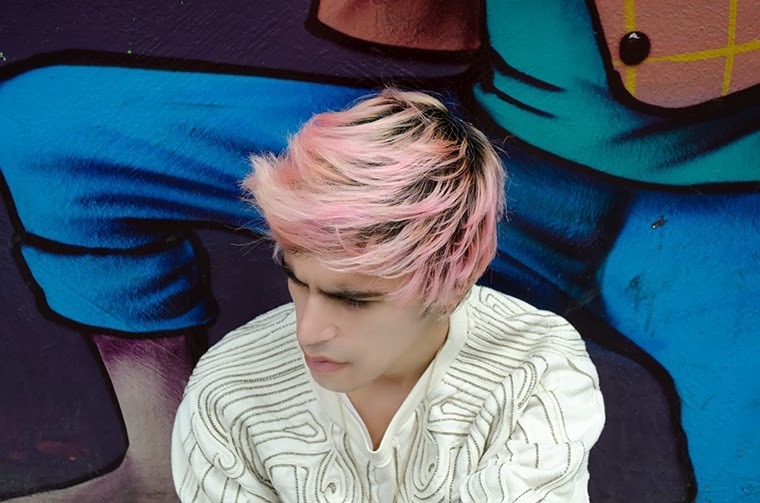 Lo amo. 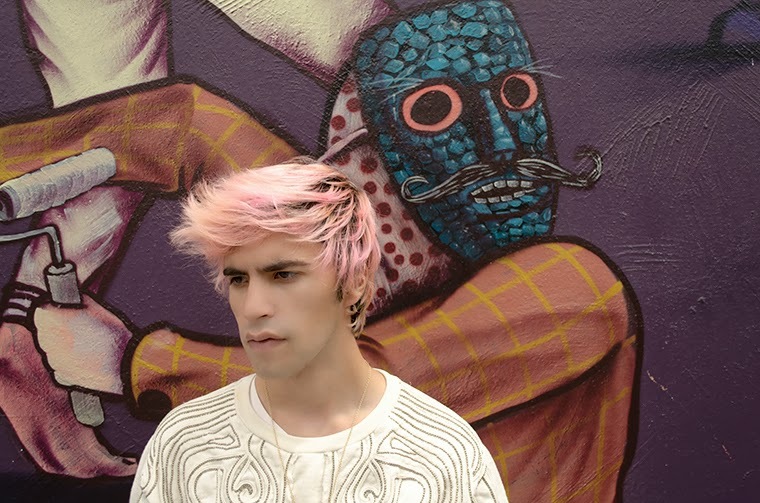 El Art Wall Project consiste en Lacoste apoyando artistas con talento poco convencional, trabajando con ellos para, juntos, crear diseños padres, divertidos y únicos para la marca. El evento sucedió en la tienda principal de Lacoste y estuvo increíble. Tenían una BBQ en un jardín (que incluyó malvaviscos en palito. MORÍ), un millón de limonadas Perrier, palomitas, una pared para tomar fotos con varios letreritos chistosos y una galería de arte bajo tierra con escenario para un pequeño concierto. Bien padre. 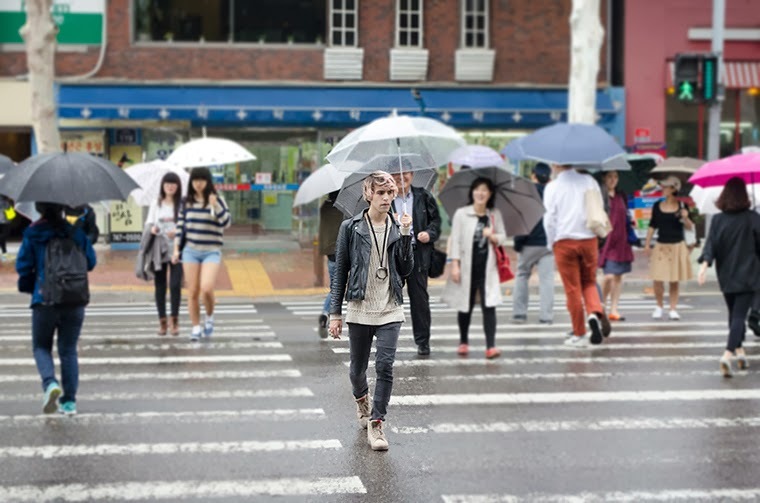 Fui el único invitado internacional así que fue muy interesante estar rodeado por gente importante de la industria de moda coreana. 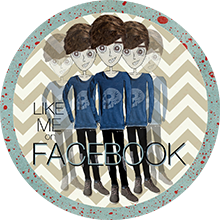 Conocí diseñadores, modelos, fotógrafos, bloggers, editores, un poco de todo. Además, todos fueron súper amables y dispuestos a platicar un rato (aún con su a veces limitado inglés). La atmósfera fue muy agradable. 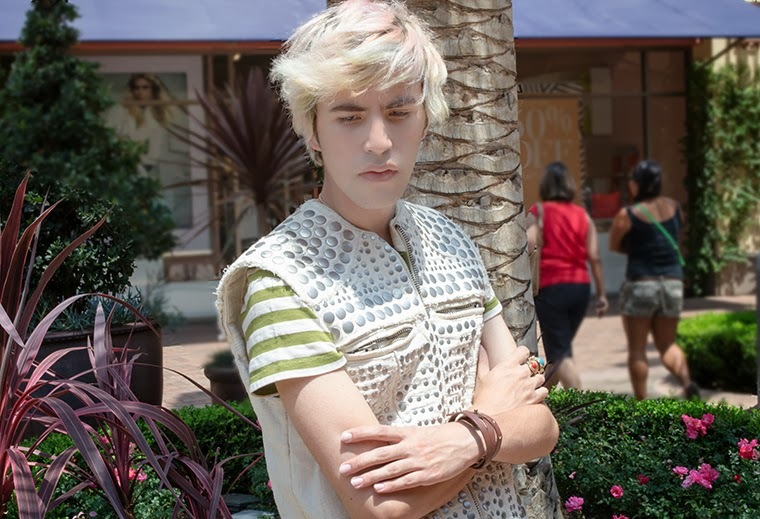 Se sintió como ir a mi primer evento de moda, otra vez. La diferencia es que esta vez supe con anticipación, por suerte, que podía invitar a un amigo, jaja. 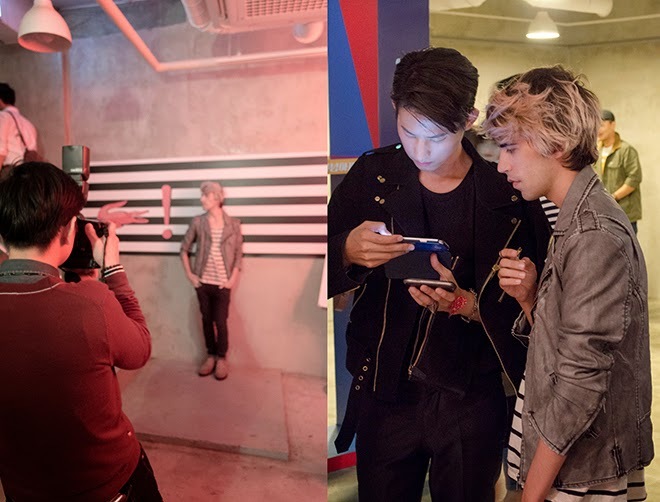 (LEFT): Me & designer Andee Kang / (RIGHT): Me & Shin Nahyung, model. And, of course, getting my photo taken never hurts. Hehe. Thanks to the Lacoste Live team and APR for the invite. I had a blast. 1. Black jacket, from Asos. 2. 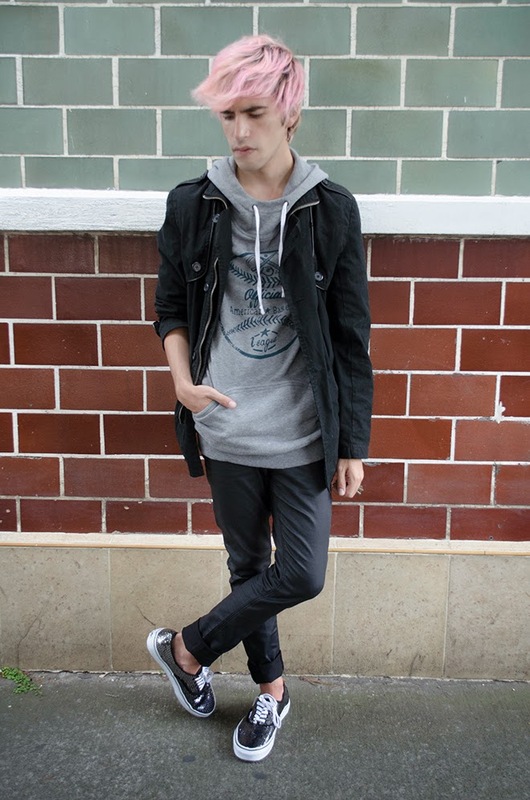 Varsity cowl neck gray hoodie, from Asos. 3. Leather look jeans, from H&M. 4. Sequined sneakers, from Vans. 5. The seven dwarfs, from Snow White, double finger ring, thrifted. A while ago (refresh your memory here), I talked about how every man needs a black jacket in his wardrobe. I think it's one of the most versatile clothing items there is. Since October is about going back to basics, I figured important to honour the great, reliable, good black jacket once again and; also, discuss a bit about basic pieces in the closet. I like to wear sweatshirts and hoodies, a lot, but always feel they're too casual (unless they have fancy details, fancy is fancy, y'all). 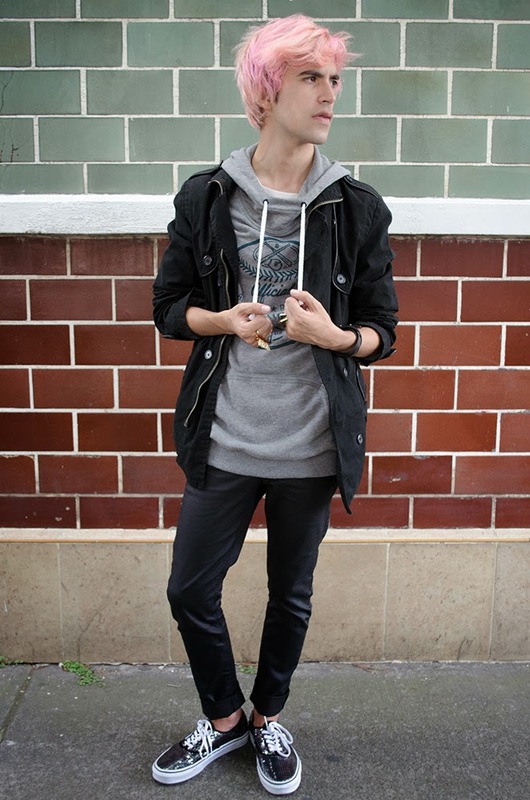 A great way to have all the comfort that comes with a hoodie is to pair it up with a cool jacket, dark jeans/trousers (I tend to think that they're less casual than lighter jeans) and add some magic to the mix. In this outfit, the dressing on top are my sequined Vans sneakers that, although being basically black, stand out thanks to all of their silver-ish glitter power. So there you go, a "casual yet completely appropriate for going to dinner with your friends at a Chinese restaurant where they actually speak chinese and nothing else outfit" option for those sweatshirt lovers like me. // Hace un rato ya (refresquen su memoria aquí), hablé de cómo todo hombre necesita una chamarra negra en su armario. Creo que es una de las piezas de ropa más versátiles que hay. Y ya que octubre se trata de volver a lo básico, creí importante honrar otra vez a la grandiosa, confiable y buena onda chamarra negra y; además, hablar un poquito de piezas básicas en el clóset. 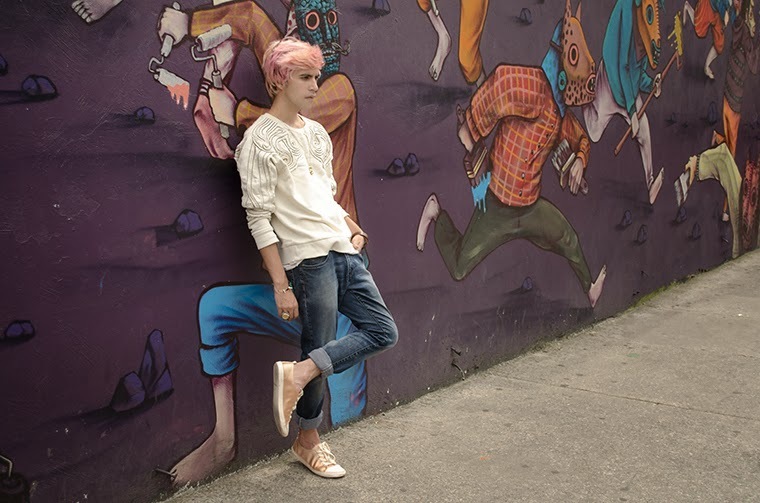 Me gusta mucho usar sudaderas, con capucha y sin capucha, pero siempre siento que son un poquito muy casuales (a menos que tengan algún detalle fancy; fancy es fancy, oigan). 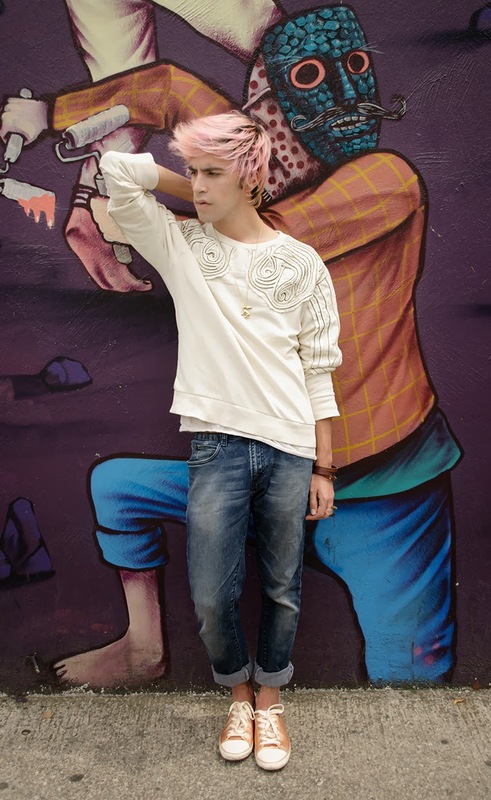 Una gran forma de tener toda la comodidad que viene con la sudadera es combinarla con una chamarra buena onda, pantalones/jeans obscuros (tiendo a pensar que son menos casuales que los más claros) y añadir un poco de magia a la mezcla. Con este atuendo, la cereza en el pastel viene en forma de mis Vans de lentejuelas que, aún siendo básicamente negros, destacan gracias a todo el poder plateado de su brillo. Así que ahí lo tienen, una opción de "atuendo casual pero completamente apropiado para ir a cenar comida china en un restaurante chino donde hablan sólo chino" para aquellos amantes de las sudaderas, como yo. I also like to try cool accessories, for example this double finger ring that has the seven dwarfs from Snow White in it. What do you think, you like? // También me gusta experimentar con accesorios buena onda, por ejemplo este anillo doble que tiene a los siete enanos de Blanca Nieves. ¿Qué piensan, lo aman? Currently listening: Victoria Justice - Gold. We've been talking about going back to basics. Let's do that here too. The first event I've ever been to celebrated a store opening and it's always nice to see new options available for the Mexican market. 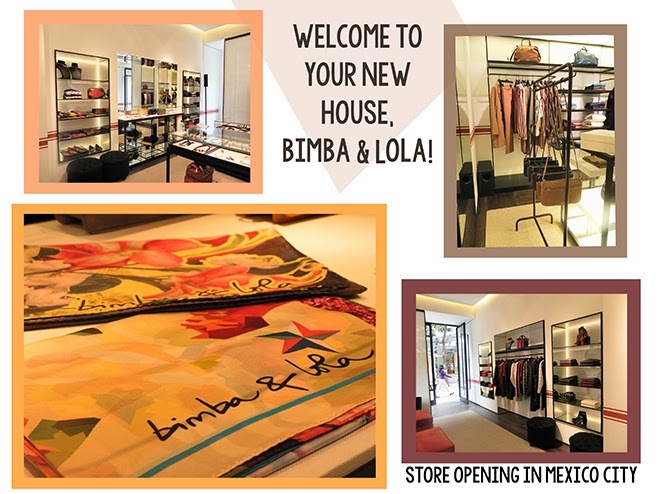 This time it was the really fun Spanish brand bimba&lola who opened the doors of its new house at Mexico City. It arrived with the fall and winter collection, heavily inspired by the documentary Grey Gardens. It's funky, fancy, luxurious and deliciously weird. 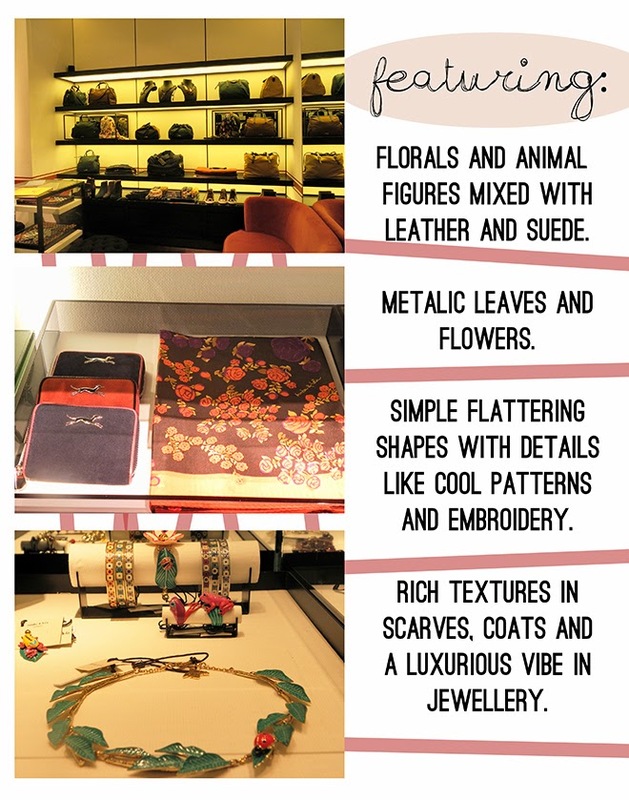 There's a lot of nice patterns, textures, animalistic jewellery and nature inspired prints. It's an updated version of vintage cuts and a true tribute to little and big Edie Bouvier Beale. 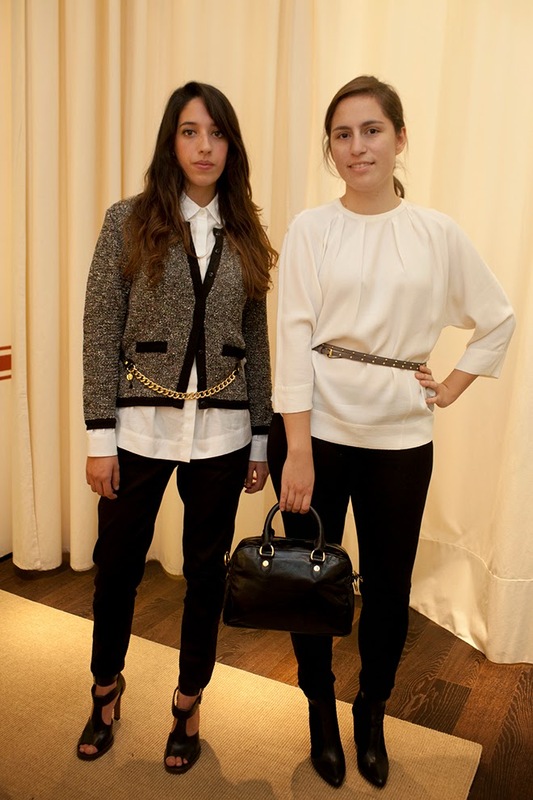 My friends Ana Cristina and Fer were able to style themselves in a cool friendly competition. I really like their choices, these girls made me proud and, also, made me remember how much I love when the brands do these things. 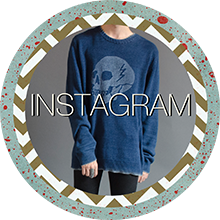 It's not just about getting information and sharing it, it's about having fun with fashion. So congrats bimba&lola! I think you did a great job and that you'll have tons of success in Mexico. // Hemos estado hablando de volver a las raíces. Sigamos haciendo eso. El primer evento al que fui celebró la apertura de una tienda y siempre es padre ver nuevas opciones disponibles para el mercado mexicano. Esta vez fue la divertida marca española bimba&lola quien abrió las puertas de su nueva casa en el Centro Comercial Antara, en Polanco. 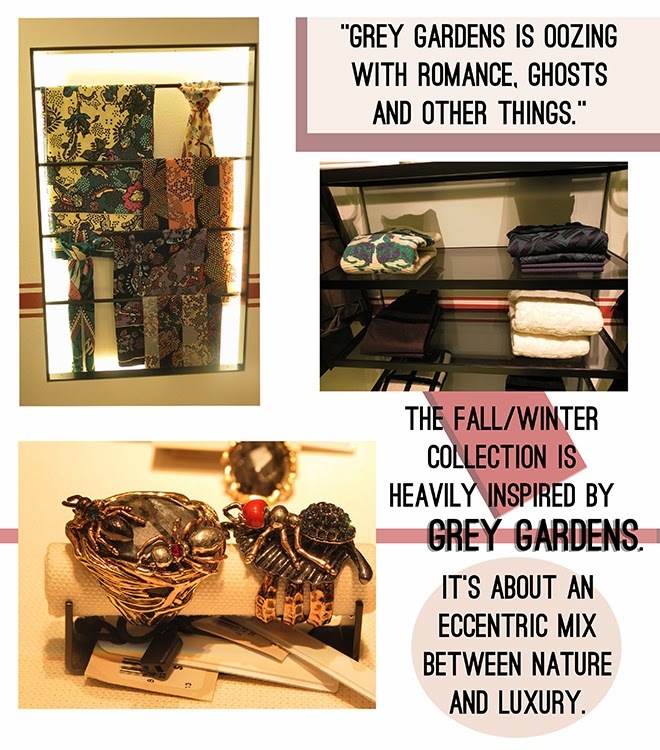 Llegó con la colección otoño invierno, altamente inspirada por el documental Grey Gardens. Es elegante, chistosa, lujosa y deliciosamente rara. Hay muchos patrones padres, texturas, joyería de animales y estampados inspirados en la naturaleza. Es una versión moderna de algunos cortes de antaño y un verdadero tributo para la pequeña y también para la grande Edie Bouvier Beale. Mis amigas Ana Cristina y Fer tuvieron la oportunidad de crear un atuendo en una pequeña competencia amigable. Sus resultados me gustaron mucho, me hicieron sentir como papá orgulloso y, además, me hicieron recordar cuánto me gusta que las marcas hagan este tipo de cosas. No sólo se trata de dar información y compartirla, también de divertirse con la moda. Así que ¡felicidades bimba&lola! Creo que hicieron un gran trabajo y tendrán mucho éxito en México. Thanks again to the Lenom PB team for the invite! Photos taken by Ana Cristina and Fer. Back to Basics. Starting October Right.